The development of young PEI classical musicians is a key mandate for the PEISO. To this end, the PEISO supports the Suzanne Brenton Award, an annual scholarship named after a former orchestra member. The Award was created by a financial gift from Suzanne Brenton who began to learn cello in her early 60s! Every year a top young PEI music student is selected from soloists performing in the PEI Kiwanis Music Festival. They are awarded a cash prize and an invitation to perform a work with the PEISO. The winner of the 2018 Award is 16-year-old Judy S. Yun, an accomplished violinist and pianist. A student at Colonel Gray High School, Judy began studying violin at the age of five with Sue Irvine. She has continued her orchestral training with the Singing Strings and as a student apprentice with the PEISO. Judy has been continuing her violin study with Professor Philippe Djokic and Mark Lee of Dalhousie University. She has regularly participated in the Queens County and PEI Kiwanis Music Festivals. She was also awarded gold medals from the RCM exams in both piano and violin. 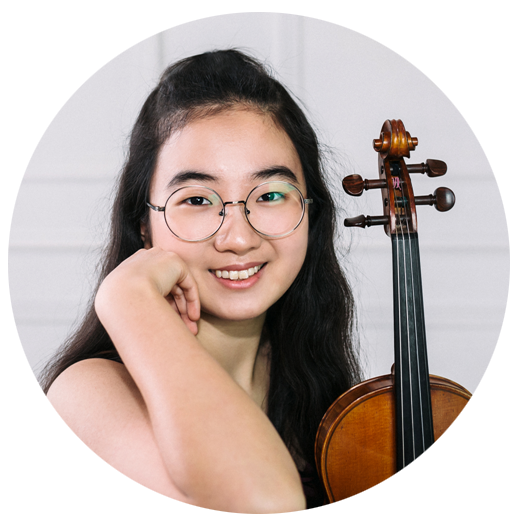 Most recently, she participated in the 2018 FCMF (Federation of Canadian Music Festivals) National competition for violin at Mount Allison University, Sackville, New Brunswick. Judy will be performing Mozart’s Violin Concert No. 5 in A major, K.219 under the baton of our guest conductor Dina Gilbert. We’ve asked Judy to share with us her thoughts on why she choose this piece and what she sees as its challenges. Why did you choose this particular piece? When choosing what to perform for this concert, my teacher and I decided on the Mozart Violin Concerto No. 5 in A major. I really admired this piece for its energetic and melodious qualities. In addition, I wanted to challenge my skills, knowing that Mozart is known to be technically demanding. Each movement features an aspect of the piece I enjoy. In the first movement, Allegro aperto, the orchestra begins with a lively exposition of the main material and then stops suddenly when the solo violin briefly plays in Adagio, then soon returning to Allegro aperto. This opening section immediately captivated my attention to what other surprises the movement had to offer. The second movement, Adagio, features rich and expressive melodies that create gentle yet deep passages. I’ve always had a feeling of warmth and comfort when playing this section of the concerto. Finally, the third movement, Rondeau-Tempo di menuetto, has a playful and elegant quality combined with a contrasting, animated passage in the middle, inspired by Turkish music. I really liked this movement due to the contrast in character between the sections and its bright and bold aspects. What challenges are you finding as your learn and rehearse the piece? Aside from the technical aspects of the piece, this concerto has many challenges. One of many is maintaining the graceful yet playful style throughout while meeting all of the technical demands. Due to its difficulty, the main challenge is not the technique itself, but creating the illusion of the piece’s simplicity. Additionally, being able to capture the essence of Mozart while maintaining a steady tempo was difficult, especially learning the piece after the Mendelssohn Violin Concerto in E minor, where I had more liberty to shift certain aspects of the piece. The cadenzas are also demanding as they are unaccompanied and very exposed. In these sections, it’s important to have good clarity and accurate intonation. Overall, the three movements, despite being very different, all share one of the most important, and difficult, challenges of Mozart’s pieces: to create simplicity and ease. When was it composed and for who? A good question. It appears that all five of the violin concerti were redated several times. The original score of the No. 5 indicated 1775 but that was scratched out and replaced by 1780. However that too was scratched out and returned to 1775. Perhaps Mozart had some second thoughts and rewrote passages and then thought again? Other details of its premiere and the performer are as clouded. What instruments did Mozart use? Solo violin, 2 oboes, 2 horns and strings. The three movements take approximately 30 minutes. Is there anything unusual about it? Mozart composed the Adagio in E major for Violin and Orchestra K.261 in 1776 at the request of Antonio Brunetti as a substitute for the slow movement of the concerto. The violinist felt the original Adagio was “too artificial”.